– In IOS-XR this command is used to configure the L2 MTU. – In IOS this command is used to configure the L3 payload size. In other words in IOS-XR we include L2 headers as part of interface MTU command, which is not the case in IOS. This implies that in order to achieve the same MTU setting between IOS and IOS-XR, IOS-XR interface MTU has to be 14B (bytes) higher for Ethernet and 4B higher for POS interfaces compared to IOS setting. Assume CE can send 1500 ip packets, that mean it l2 mtu is 1504. If config “rewrite ingress tag pop 1 symmetric”, you will not need carry vlan tag. 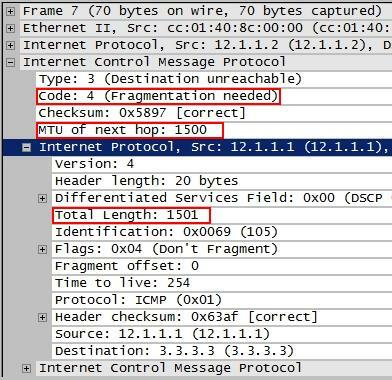 %MFI-3-MPLS_MTU_SET: Setting mpls mtu to 1508 on Serial1/0 which is higher than the interface mtu 1500. This could lead to packet forwarding problems including packet drops.